You can link directly to our Meeting Dates page to see the updated schedule for all general and sport specific meetings. Below are descriptions of these meeting types. Recognition of state tournament officials. Committees formed to research or conduct association business. Votes taken on association action items. "Old Business" items updated and/or resolved. 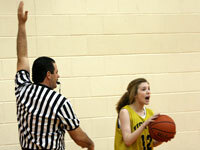 Five or more "sport specific" meetings are held each year in the six sports our officials work. Each sport has a designated "trainer" who is responsible for these meetings. Trainers do not necessarily conduct each meeting personally. However, he/she is responsible for ensuring that someone does run the meeting, and that each meeting has a specific lesson plan and goal. Typically these sport specific meetings occur "in-season," but trainers are free set the schedule to best suit the officials who work their sport. In addition to these meetings, which are held in a classroom environment, each sport typically has one or more scrimmages and mechanics clinics. These events help new officials get acclimated to the sport and allow veteran officials to get ready for the season. Fruit Belt Officials Association By-Laws require active members to attend at least two of the three General Meetings as well as 80% of any sport specific meetings held for the sports they officiate. Members may be excused from meetings for legitimate reason by contacting the FBOA secretary, or in the case of sport specific meetings, the sport trainer prior to the meeting date. Members not fulfilling this obligation will not be listed on the "Member in Good Standing" list updated periodically to the Michigan High School Athletic Association.